Close your eyes and picture the the warmest welcome you know. Now imagine the chair version of that happy hello, and you get this. The Big Joe Aloha Chair. It’s super lightweight and so ultra-comfy, you may feel the urge to say 'aloha' back. And that’s ok. As long as no one’s looking. On second thought, who cares if people are looking. Let ‘em look. Nothing wrong with a friendly chat with your furniture. 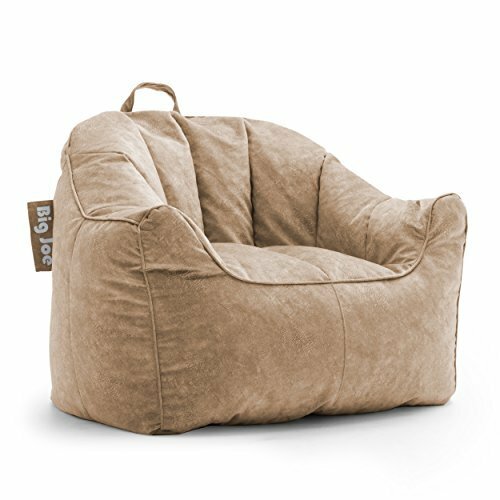 Like all Big Joe Chairs, its sealed with 2, safety locking zippers for child safety - but don't worry! If you need to add more filling, just take a look at the tag sewn into every bag, it shows how a paper clip or safety pin can unzip the bag to refill it with fresh beans. And while we're talking beans, did you know that our beans are 100% recyclable, and are made from 80% recycled materials? Big Joe loves being green almost as much as we love making you feel comfortable. But we don't stop with you or Mother Earth. 10% of all profits are donated back into the community. When Big Joe says ""Comfort For All!"" - we mean it! This Big Joe Aloha chair is filled with our standard, Ultimax bean filling. All bean filled chairs eventually go flat depending on how much lounging you do, but our standard Ultimax filling lasts 20% longer than our competitors and comes wtih a 90 day manufacturer warranty.